Members of the B.C. Legislature were contacted about concerns from Ottawa over a security threat, days before the shooting at the National War Memorial and Parliament Hill on Wednesday. Speaking to MLAs on Wednesday, B.C. Premier Christy Clark said there would now be a full review of security at the B.C. Legislature. Later, Clark told reporters it was important to find a balance between necessary concerns over security and being "very careful not to shut the public out." "We don't want the Legislature fenced in and shut off. We want to ensure the public continues to have access to these institutions," she said. "If we cut off our democratic institutions from the public, it means the people who practise terror have won a victory and we cannot allow that to happen." On Wednesday morning, House Clerk Craig James would not speak in detail about the non-specific threat, but told reporters "steps were taken." "We are aware and have been aware of a heightened concern from entities in Ottawa for least a few days," said James. "We didn't receive caution, we received information that there may be a problem...We had discussions with certain members of the assembly to be prudent and keep them informed." Later, B.C. Finance Minister and House Leader Mike de Jong told the Legislature he had heard about heightened awareness over security earlier in the week but gave no specifics. Sergeant-at-Arms Gary Lenz said there was no specific threat to the B.C. 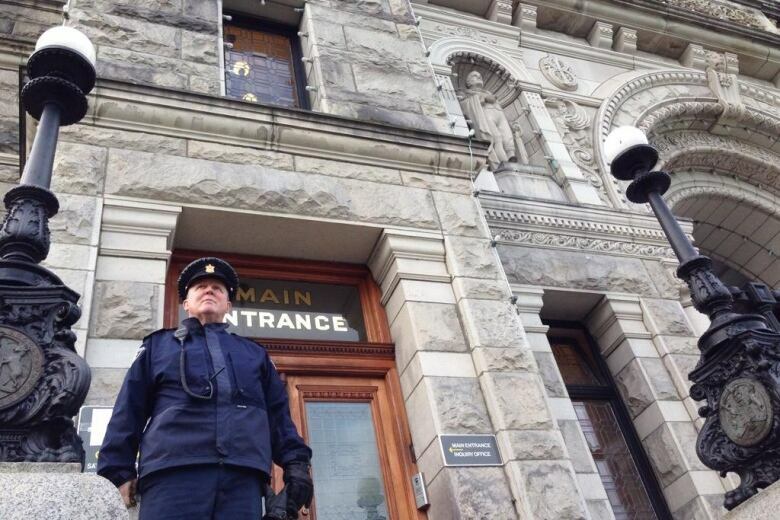 Legislature in Victoria, but extra security measures are being put in place in B.C. following the Parliament Hill shooting. "We are regularly in contact with the appropriate agencies to determine our response in B.C. and we will continue to monitor those and respond appropriately at that time," said Lenz. Lenz said some staff at the Legislature do carry firearms and it is part of its overall security strategy, but would not go into specifics. Cpl. Nathan Cirillo, 24, was shot dead by an attacker, identified as Canadian citizen Michael Zehaf-Bibeau, at the National War Memorial on Wednesday morning. Zehaf-Bibeau was shot dead shortly afterwards inside the Centre Block of the Parliament buildings, and much of the downtown area remains on lockdown. Court documents obtained by CBC News show that Zehaf-Bibeau had previously pleaded guilty to charges including drug possession and robbery and had a criminal record in Quebec and British Columbia. Kevin Vickers, the House of Commons sergeant-at-arms who is being hailed as a hero for reportedly shooting the suspect, is the brother of Victoria resident John Vickers. In Victoria, the Canadian flag was lowered to half mast at the B.C. Legislature and extra guards were in place at each entrance Wednesday morning. No unscheduled tourists or members of the public are being permitted to enter the Legislature, although pre-booked school tours are still being allowed into the building. The Legislature will sit as planned with all legislative business continuing as usual, said Lenz. In a statement Wednesday, Victoria police Chief Const. Frank Elsner said the department's officers, staff, and community are "saddened by the terrible events that have occurred in Ottawa." "We have no information of any specific threat within our jurisdiction," said Elsner. "But rest assured the safety of every member of our community, including those in the Canadian Armed Forces and B.C. Legislature, is our top priority." B.C. Premier Christy Clark tweeted Wednesday that "B.C. stands with all of Canada against the violence in Ottawa, and with the brave men and women keeping our capital safe." BC stands with all of Canada against the violence in Ottawa, and with the brave men and women keeping our capital safe. Later at the Legislature, she told MLAs she called for a moment of silence, before the house addressed the security issues arising from the Ottawa shooting. NDP Leader John Horgan told gathered MLAs "our democratic institutions must be open and accessible" despite security concerns. 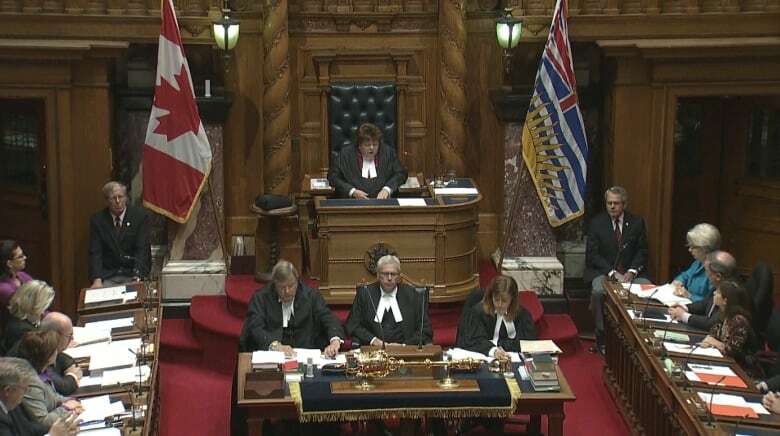 Deputy Speaker Linda Reid expressed similar sentiments, saying the Legislature is the people's Parliament and it will be open to serve the people. Speaking earlier on Wednesday, B.C. Jobs Minister Shirley Bond said, "Our thoughts are with the families of people directly impacted." "It is hard to accept this as a Canadian. We just don't think this kind of thing happen here in Canada." In a statement Wednesday, Vancouver Mayor Gregor Robertson said Vancouver is taking every possible added precaution in light of events in Ottawa. "Today's news from the nation's capital is shocking and tragic," said Robertson. "Vancouver's thoughts and prayers are with the people of Ottawa and the family of the Canadian soldier whose life was lost today." "All Canadians owe tremendous thanks to Canada's first responders and our colleagues in Ottawa who are working hard to support those affected by these senseless acts of violence." The city of Vancouver tweeted out a message of shock at the Ottawa shooting on Wednesday. In a message to staff, the city also said there is no indication of any threat posed to city employees or buildings, but there would be increased security at City Hall and various city facilities "until the situation stabilizes." "The events on Parliament Hill and in the city of Ottawa are unprecedented," said the message to staff. "Therefore we are taking an abundance of caution and have been in discussion with the [Vancouver police department] and corporate security and have taken additional security measures." The message said there would be more uniformed security guards and VPD officers stationed at City Hall and more contract security patrols at other city facilities. Meanwhile, the French International School of Vancouver told parents the embassy of France in Canada had advised them to adopt additional security measures until Friday. In an email to parents, school principal Gerard Martinez said the school main entrance door will be closed at 9:10 a.m. PT and will be reopened only from 3:10 p.m. In response to the shootings, Vancouver Airport has also increased security, stepping up patrols and announced on Twitter that their thoughts are with those in Ottawa. B.C. Transit police also announced they would be boosting security in a tweet on Wednesday morning. In a statement, Metro Vancouver Transit Police said transit users would notice an increased presence of officers in high visibility uniforms. "Although there is no specific threat to the TransLink system or infrastructure at this time, our officers remain vigilant," said the statement. At the Canadian Forces military base in Esquimalt, B.C., the only visible change was the addition of military police at several posts, where unarmed Commissionaires would usually check IDs. Capt. Steve Rideau, base commander, told reporters, "We are horrified by the events that have unfolded in the National Capital Region and our prayers are with our fallen servicemember and his family." Rideau would not go into the specifics of any changes to security at the base, but stressed that members at the base are not being told to avoid wearing uniforms in public. However, he said, security measures may be reviewed and changed pending any decision taken at a national level. Vancouver police also issued a statement Wednesday stating they continue to work with the RCMP and the Canadian Security Intelligence Service to ensure the safety of Vancouverites. "Although there is no specific threat to Vancouver or the province of British Columbia, in light of current events in Quebec and Ottawa, our officers remain vigilant," wrote Sgt. Randy Fincham. Later on Wednesday, Vancouver police confirmed the VPD and the B.C. RCMP are working together to assist an Ottawa police and RCMP national security investigation. Police are encouraging the public to report anything suspicious by calling 911 or the RCMP National Security Information Network at 1-800-420-5805. Michael Zehaf-Bibeau, slain Ottawa shooter, had criminal record in Quebec, B.C.